Practical and convenient gentlemen outfit, you'll never worry about how to match your cute baby. Suspenders also can removed for another casual look. We choose skin friendly fabric and soft fabric for a better customer feel. 6-9 Months=(Tag 70)------Chest 22.8"---Shoulder 9.4"----Sleeve 11.0"---Top Length 13.8"
9-12 Months=(Tag 80)-----Chest 23.6"---Shoulder 9.8"----Sleeve 11.8"---Top Length 14.6"
12-18 Months=(Tag 90)----Chest 24.4"---Shoulder 10.2"---Sleeve 12.6"---Top Length 15.4"
18-24 Months=(Tag 100)---Chest 25.2"---Shoulder 10.6"---Sleeve 13.4"---Top Length 16.1"
2-3 Years=(Tag 110)------Chest 26.0"---Shoulder 11.0"---Sleeve 14.2"---Top Length 16.9"
3-4 Years=(Tag 120)------Chest 26.8"---Shoulder 11.4"---Sleeve 15.0"---Top Length 17.7"
6-9 Months=(Tag 70)------Waist 16.5"---Pants Length 17.3"
9-12 Months=(Tag 80)-----Waist 17.3"---Pants Length 18.1"
12-18 Months=(Tag 90)----Waist 18.1"---Pants Length 18.9"
18-24 Months=(Tag 100)---Waist 18.9"---Pants Length 19.7"
2-3 Years=(Tag 110)------Waist 19.7"---Pants Length 20.9"
3-4 Years=(Tag 120)------Waist 20.5"---Pants Length 22.0"
We are committed to providing each customer with the highest standard of customer service. Any questions please feel free to send us message, we will reply you fast in 12 hours. 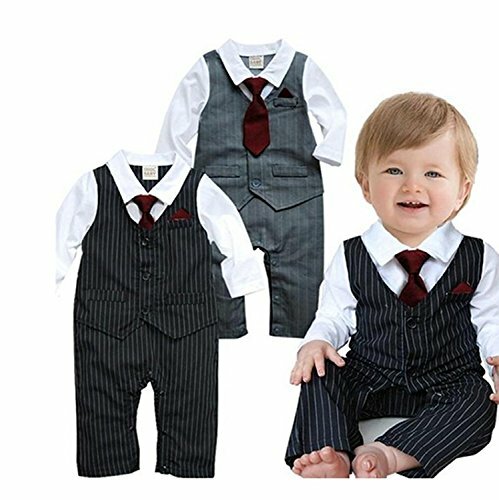 Good gift for your newborn or infant baby, fashion, handsome and high quality; Various formal occasion available, such as wedding, first birthday,family photos, baptism, Christmas ect. 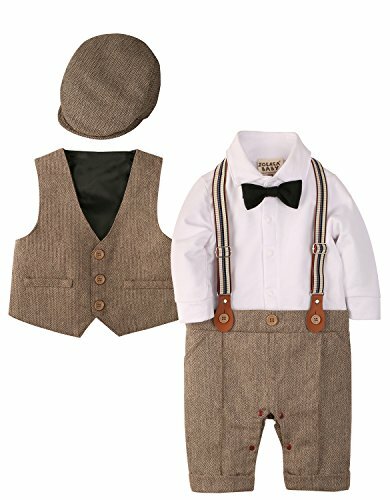 ZOEREA 3pcs Long Sleeves Gentleman Jumpsuit & Vest Coat & Berets Hat with Bow Tie for Baptism, Pageant, Party, Wedding, Church, Cocktail Party or Birthday All these baby kids clothing sets are of good quality,reasonable price & cute fashion design. Size Information:(in inch) ( measurement tolerance within 0.4-0.8 inches) Label 60 / Body height:20inch-24inch | hat circumference: 15.7-17.3 inch Label 70 / Body height:24inch-28inch | hat circumference: 16.5-18.1 inch Label 80 / Body height:28inch-32inch | hat circumference: 17.3 -18.9 inch Label 90 / Body height:32inch-36inch | hat circumference: 18.1-19.7 inch Please note 1.Items are measured by hand,there will be a slight deviation.Hope you understand. 2.The item color displayed may be slightly different on your computer monitor since monitors are not calibrated same. Package include: 1pc jumpsuit + 1pc vest coat + 1pc black berets hat. We ZOEREA pursue to offer you the best service. And we hope that when you have any question in these item, please contact us, sending us an email through your Amazon account. Then we could handle your issue as soon as possible. We offer 30 days money back and replacement with no hassle! Order now and ship right away. Thank you! DESIGN ---Tuxedo Designed Suitable for Baptism, Pageant, Party, Wedding, Church, Cocktail Party or Birthday.Long Sleeve suit set for autumn, spring. Adorable beret with bow tie design, look more gentleman and fashion. BEST GIFT ---It has buttons in the crotch,button closure, convenient for wear and diaper changing.It is also a nice gift to your lovely baby. WASHING INSTRUCTIONS --- Gentle machine or hand washable at Max 40 (104 ).Better to wash separately from other color clothes. Package include: 1pc jumpsuit + 1pc vest coat + 1pc black berets hat. Perfect for any occasion such as wedding, party, birthday, holiday, church, and other special events. 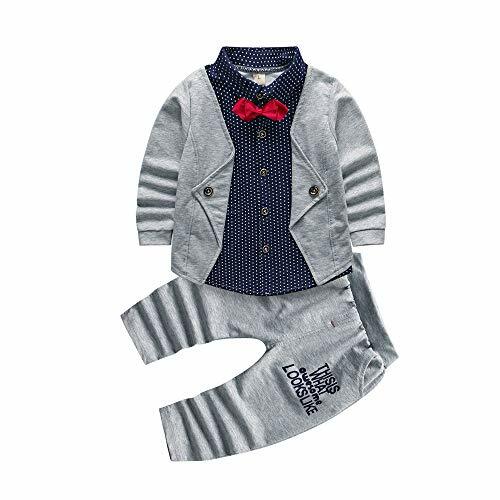 This smart 5-piece boy formal suit includes jacket, shirt, bow tie, Pants and Vest. 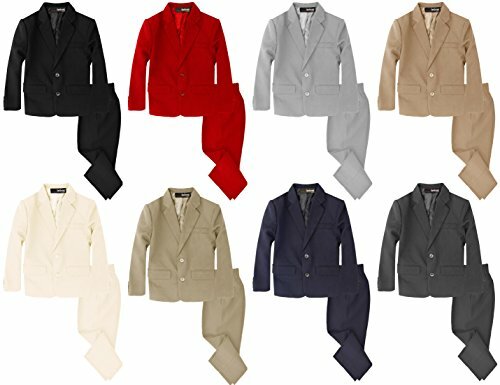 Luxurious Polyester (35%) and Cotton (65%) fabric. Fully lined black jacket is single breasted with a button detail, 2 side pockets, and padded shoulders. Shirt is in white with adjustable button cuff. Matching fully lined Vest has buttons for closure and 2 side pockets. Smart Pants have half elastic waist for comfort and perfect fit. Orangic cotton, soft and breathable. Occasion: birthdays, wedding, churches, parties, etc. Notice:Tag sewned to the outside of the garment;If don't like,Easily fixed with a seam ripper and a few stitches. 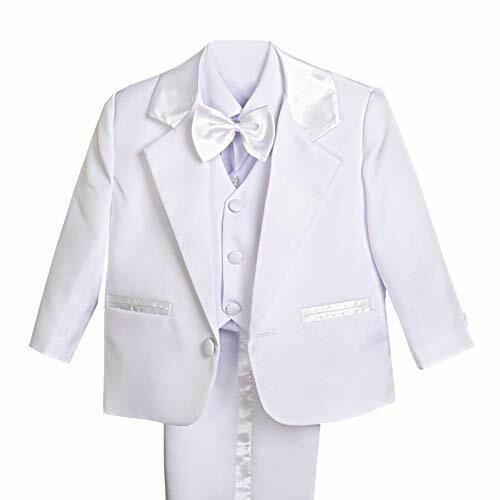 1PCS Tuxedos Suit Features: Adorable cute and fashion onesie one piece long sleeve cotton romper outwear,with bow tie design,buttons down design of vest and snap up closure crotch style,great gifts for toddler boys. Material: cotton blend,soft,comfort,elastic,stretch,breathable and absorbable. Season: Spring,Fall,Winter. Occasion: casual,daily wear,play wear,out wear,party,birthday,wedding,baby shower gifts,christening,pegeant,christmas,thanksgiving,easter,photo prop shoot,photography,pics taken,family picture time and other special occasions. Great gifts for little babies,great idea buying for your son,grandson and nephew. 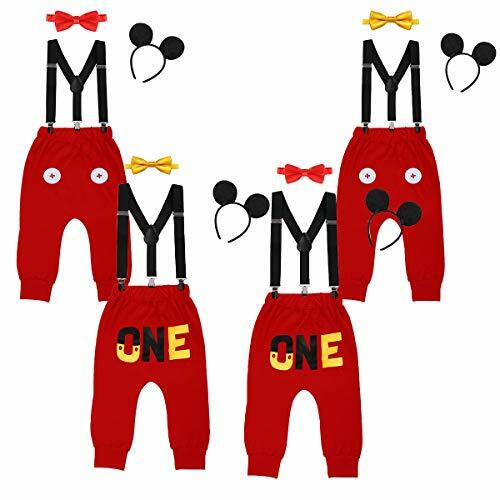 Size suit for 0-3 3-6 6-9 9-12 12-18 18-24 months babies. 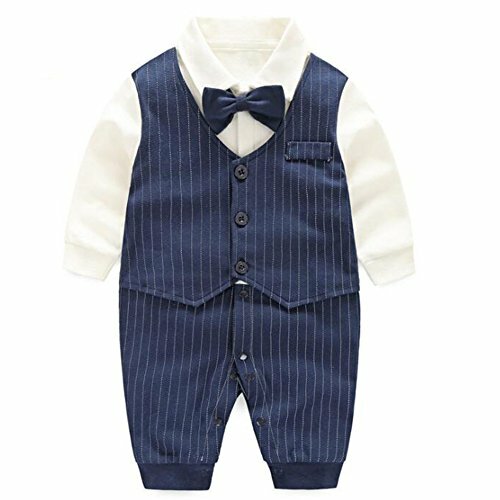 Package include: 1pc baby long sleeve gentleman outfit. Welcome to IMEKIS store. Are you looking for a handsome costume for your little prince? 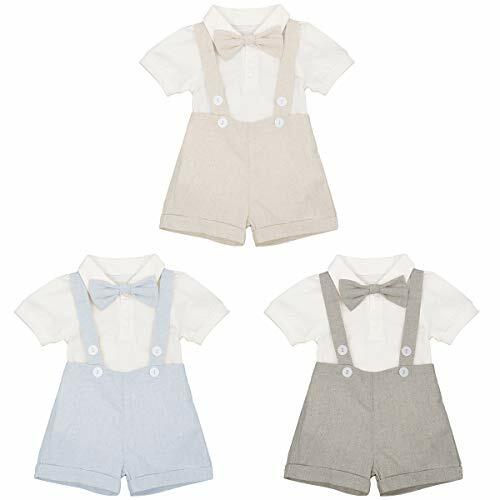 By IMEKIS Designed baby girl formal rompers suit, so cute and chic! About this Item: Condition: New With Tags Package Include: 1PC Romper + 1PC Suspender Shorts + 1PC Bowtie Material: Cotton Blend Features: Short Sleeve, Turndown Neck, Solid Color, Elastic Waist, Snap Crotch Season Suitable: Spring, Summer, Autumn, Winter Care Instructions: Hand wash in cold water, line dry, do not bleach or iron. Size Chart: The size is of manual measurement, please allow slight 1-3cm difference and refer to the details to choose the suitable size Tag No.70 (0-6 Months); Chest: 18.0" / 46cm; Romper Length: 14.5" / 37cm; Waist: 17.0-20.0" / 43-50cm; Pants Length: 8.0" / 20cm; Tag No.80 (6-12 Months); Chest: 19.0" / 48cm; Romper Length: 15.5" / 40cm; Waist: 18.0-21.0" / 46-54cm; Pants Length: 8.5" / 22cm; Tag No.90 (12-18 Months); Chest: 20.0" / 50cm; Romper Length: 16.5" / 43cm; Waist: 19.0-22.0" / 48-56cm; Pants Length: 9.5" / 24cm; Tag No.100 (18-24 Months); Chest: 21.0" / 53cm; Romper Length: 18.0" / 46cm; Waist: 20.0-23.0" / 50-58cm; Pants Length: 10.0" / 26cm; Friendly Tips: Photo color might be a little different from the actual product due to color display of different monitors. Customer Service: We offer every customer a superior customer service, please send us e-mails directly if you have any questions or concerns. MULTI-PURPOSE: This chic outfits is perfect for wedding party, Ring Bearer, first birthday, cake smash parties, first communion, baptism, christening, formal, evening, pageant, prom, casual, daily wear, Halloween cosplay, fancy dress up costumes, Christmas Xmas party, Easter, carnival, Children's Day, homecoming, banquet, school dance prom, photograph props, photo shoot, ceremony, holiday, vacation, beach, performance, show, graduation, boutique or other special occasions. Nautica turns him into a handsome little man with the help of this stylish vest, shirt, and pants that's accompanied by tie or bowtie. 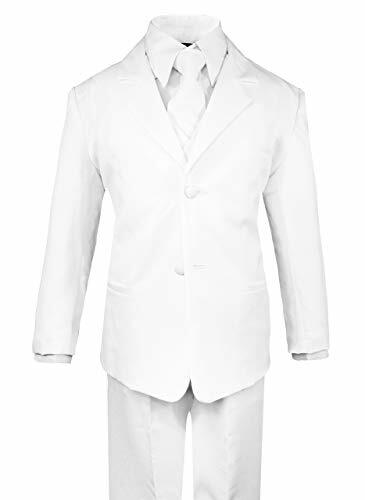 Perfect for : First Communion,Baptism,Christening,Graduation,Birthday,Ring boy. Dress him in a refined White-tie look with this classic fit formal dress set from Edmundo Add shoes and he's ready for any special event! 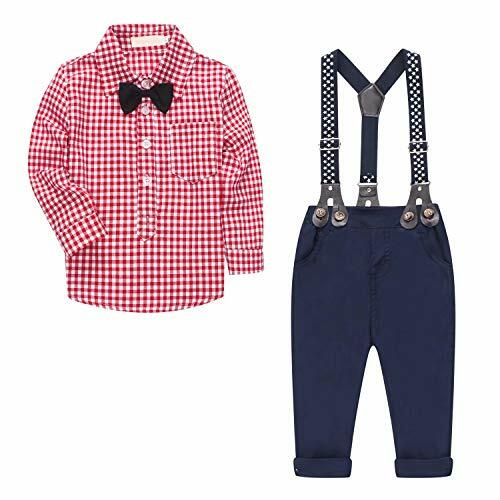 SUSPENDERS & BOW TIE: Toddlers It's My 1st Birthday gentleman tuxedo costume, adjustable elastic Y Back suspenders designed with 3 strong clips and 2 length adjusters, easy to open clip, enough strength to hold your pants up tightly. Matching with pre-tied bow tie to be a completed handsome gentleman costume, perfect for cake smash photograph props. You could take a photo or video to record your prince precious moments at his 1st birthday smash cake party! 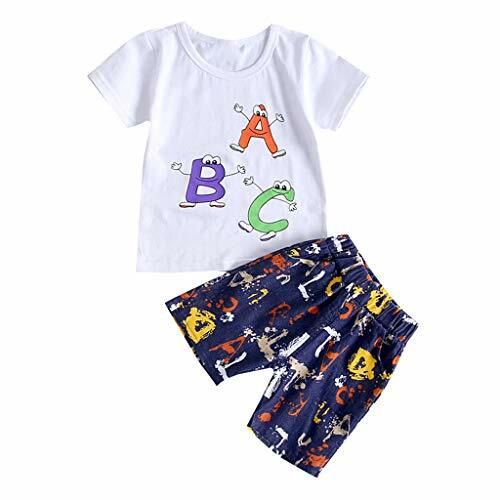 Recommended Age:6-12 Months---Tag Size:80---Bust:52CM/20.5''---Tops Length:32CM/12.6"---Waist:40CM//15.7''---Shorts Length:24CM/9.4" Recommended Age:12-18 Months---Tag Size:90---Bust:55CM/21.7"---Tops Length:34CM/13.4"---Waist:42CM/16.5''---Shorts Length:26CM/10.2'' Recommended Age:18-24 Months---Tag Size:100---Bust:58CM/22.8"---Tops Length:36CM/14.2"---Waist:44CM/17.3"---Shorts Length:28CM/11.0" Recommended Age:2-3 Years---Tag Size:110---Bust:61CM/24.0"---Tops Length:38CM/15.0"---Waist:46CM/18.1"---Shorts Length:30CM/11.8" Recommended Age:3-4 Years---Tag Size:120---Bust:64CM/25.2''---Tops Length:40CM/15.7"---Waist:48CM/18.9"---Shorts Length:32CM/12.6"
FASHION OUTFITS:Super cute baby boy hoodies.Suitable for outdoor activities, baby photograph, or any occasions.Cute baby boy all season clothing set 0-24 Months ,so beautiful set for your little boy! We are committed to making our customers have a better shopping experience.if you have any questions about our products or service, please do not hesitate to tell us and we will do our best to solve and improve it. High quality product, substantial and very nicely finished. 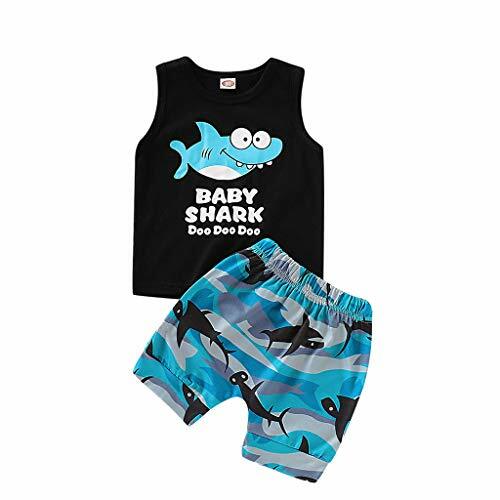 newborn infant baby boy girls camouflage clothes hooded t-shirt tops pants outfits baby boys clothes sets bow ties shirts suspenders pants toddler boy gentleman outfits suits unisex item, very modern and cool. 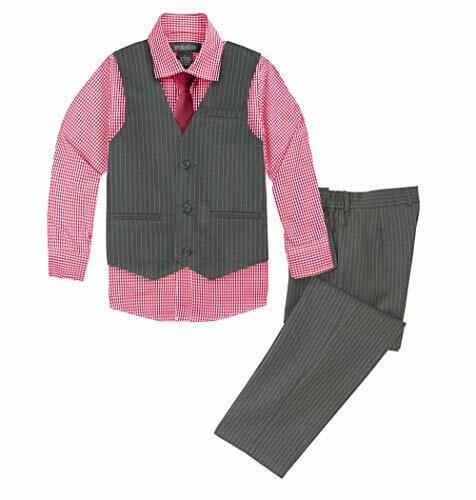 Dress your boy from head to toe in Spring Notion's four-piece Pinstripe Vest Set. Our pinstripped vest and dress pants are paired with a button-down shirt and coordinating tie. Perfect for weddings, parties, and other special occasions. Shirt is 35% cotton and 65% polyester. Vest, pants, necktie and bow tie are 100% polyester. Hand wash. Hang Dry. Spring Notion's four-piece outfit includes vest, shirt, pants, and necktie. Pinstripes polyester vest. Fully lined. Matching pinstripes pants with elastic waist on the sides. Pants have side pockets and one back pocket with button closure. Dress Shirt - 35% Cotton and 65% Polyester. Imported. Material: Cotton blend, Soft and breathable material, pampering your baby's skin.Soft,breathable ,good elastic, lovely colors,very practical for the rapid growth in babies. Feature: Scoop neck, letter cartoon print, short sleeve, elastic shorts, two pockets, T-shirt pants 2pcs. Package include:1PC shirts+1PC pants. Both hand wash and machine wash is OK.